In part 1 of this article, I reflected on the new Lancet Breastfeeding Series and other significant developments in January concerning our mission to protect breastfeeding and protect babies fed on formula. My focus was on the paper concerning health benefits and I looked at the underlying reasons where breastfeeding rates are low, particularly in the UK. In part 2, I will look in more depth as some of the other papers and comments in the Lancet Breastfeeding Series, with a focus on the role of the infant formula industry in undermining breastfeeding and misleading mothers – and what the International Baby Food Action Network (IBFAN) and Baby Milk Action/IBFAN-UK are doing to hold the industry to account. Our principal tool is the International Code of Marketing of Breastmilk Substitutes and subsequent, relevant Resolutions of the World Health Assembly (the Code and Resolutions). The Code and Resolutions basically prohibit companies from promoting products, giving health workers responsibility for supporting parents. Companies are limited to providing scientific and factual information to health workers and ensuring products comply with composition and labelling requirements. Health workers and health systems should avoid conflicts of interest and not be used to endorse or promote products. These measures do not stop breastmilk substitutes from being sold and they do not stop parents who use formula being supported by health workers. The UK is taken as one of 6 case studies in the Lancet articles, referencing a Save the Children report (Breastfeeding: Policy Matters). This cites the Baby Feeding Law Group (BFLG) monitoring project, which Baby Milk Action coordinates (right, one of our reports). We can also add the government has failed to act despite the UN Committee on the Rights of the Child calling on it more than once to fully implement the Code and Resolutions. We have submitted preliminary evidence of widespread violations once again. The next hearing on UK compliance with the Convention on the Right of the Child that will take place later in 2016. We are preparing a new monitoring report for the next hearing. Thank you to everyone who sends us details and photos of violations. These are extremely useful (my apologies that we are sometimes slow in responding due to pressure of work). Please do keep sending us information – see the call for help in UK monitoring. You can also submit examples of violations to IBFAN’s International Code Documentation Centre (ICDC), which produces the global Breaking the Rules, Stretching the Rules reports. ICDC has produced a new Android app to make this even easier to do. ICDC also provide training on the Code and Resolutions for policy makers and lawyers. If money talks – why are too few politicians listening to the economic arguments? “Our systematic reviews emphasise how important breastfeeding is for all women and children, irrespective of where they live and of whether they are rich or poor. Appropriate breastfeeding practices prevent child morbidity due to diarrhoea, respiratory infections, and otitis media. Where infectious diseases are common causes of death, breastfeeding provides major protection, but even in high-income populations it lowers mortality from causes such as necrotising enterocolitis and sudden infant death syndrome. Why then is the UK government, in many respects, going backwards? And it is surely no coincidence it has scrapped the National Infant Feeding Survey scheduled for 2015 that would have shown the impact of the government’s failure to implement the Code and Resolutions, and the cuts to breastfeeding promotion and support initiatives. (Thanks to devolved powers, some parts of the UK are doing better than others. For example, Scotland is on track to have 100% of maternity hospitals certified as baby friendly). 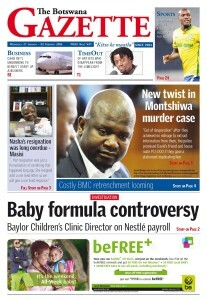 Baby Milk Action and our IBFAN partners are specialised in holding the baby food industry to account. We monitor companies against the International Code of Marketing of Breastmilk Substitues, adopted by the World Health Assembly in 1981. Subsequent Resolutions address questions of interpretation and changes in scientific knowledge and marketing practices. These are not rules that we have made up, but rules set by the Health Ministries of the world through the United Nations system. Brazil, one of the case study countries, has shown the dramatic success that can be achieved in reversing the decline in breastfeeding. There policy makers have responded to results from monitoring by IBFAN Brasil and its calls to implement the Code and Resolutions by introducing – and regularly updating – exemplary legislation. Action has been taken on other fronts as well. Nestlé is the world’s largest baby milk company. Danone is second largest, with about half of Nestlé’s market share. Both they and smaller companies break the Code and Resolutions as a matter of course, as shown in IBFAN’s monitoring reports. We raise these violations in correspondence with company executives. 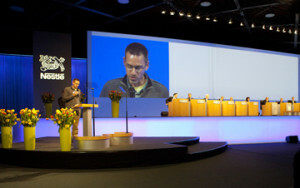 We attend the Nestlé shareholder meeting (right), where Nestlé’s Board told us that 90% of the violations we report are in line with Nestlé’s own policies. Which is why these need to change. We promote a boycott of Nestlé, which forces some changes in policies and practices, but executives have rejected the four-point plan we have put to them for saving infant lives and ultimately ending the boycott. Instead, Nestlé invests in public relations, while denying it has to make changes. The companies not only break the rules, they try to influence government policy. 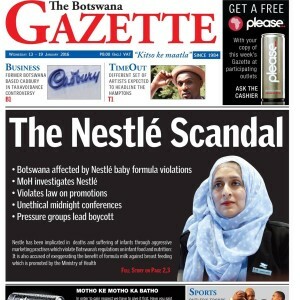 There is currently a scandal unfolding in Botswana with front-page exposés in January about Nestlé sponsoring doctors (below), and conflicts of interest involving an influential doctor (bottom of right-hand cover). We have sent a letter of solidarity to the Ministry of Health, addressing some of the false claims and assurances Nestlé makes about its business practices (health officials, as pictured on the front page, left, need our support). Company influence goes beyond this, however. Increasingly, corporations are trying to embed themselves in setting and delivering health policy. This is not altruism, of course. Any initiatives have to serve business interests, which basically means promoting consumption of processed foods over breastfeeding and natural, locally-prepared foods. Often this is done in the name of promoting nutrition. Nestlé’s Chairman, Peter Brabeck-Lemathé, is notorious for telling business leaders in Boston in 2005 when he was Chief Executive, “companies should only pursue charitable endeavors with an underlying intention of making money for investors”. He said that businesses do not have to give anything back to society as they have taken nothing out. By ‘magic’ he means that if a company finds a way to make a profit from addressing a social issue it will invest to make money and the intervention will grow. If an initiative requires public money, then the more it grows the more money governments have to find to fund it. Governments are encouraged to invite corporations to be “partners” so they can claim to be taking action, while having corporations foot the bill. Of course, this neglects the fact that more appropriate government interventions may more than pay for themselves by saving society far larger sums. This is the case with improving the protection, promotion and support of breastfeeding, as the figures in the Lancet series demonstrate. Profit-orientated corporate interventions, while attractive, may externalise costs. In this case, at the very least they are used by corporations to divert criticism of their activities and forestall marketing controls. 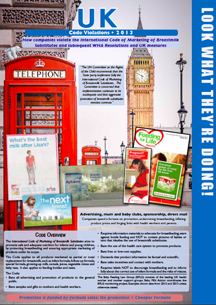 More commonly, they are strategies to target parents, carers and health workers to achieve brand endorsements. Nestlé now tries to put itself at the centre of development discussions and policy formation. For example, the United Nations Foundation held a meeting in January on Business Approaches to Advancing Women’s, Children’s and Adolescents’ Health. Nestlé Corporate Affairs Vice President (responsible for Public Relations, that is, the company’s image), said: “If we do good for society, we do good for business.” Danone was also present. The meeting was summed up with the words that participant companies are, “changing the way the UN works”. Which should be a concern. Similarly, Nestlé invests in school sports as a way to claim it is countering the rise in obesity, despite being the world’s biggest junk food company. It aims to divert attention from moves to regulate food marketing. At the same time, its investment is used to promote products, such as its Milo brand (a drink powder, which is nearly 50% sugar) to children, as in this example of the under-13 Kenyan football team heading to Nigeria for the Milo® Africa Championships (more details here). Corporations present themselves as just one “stakeholder” in society, demanding a seat at the table where policies are set. This is inappropriate in the health field. If baby food companies wish to contribute to infant and young child health then their role is to market their products appropriately – in accordance with marketing rules – and make them as safe as possible. There is currently a battle taking place at the World Health Organisation about who influences health policy. WHO is developing its Framework for Engagement with Non State Actors (FENSA). The overarching Framework treats public interest actors, who are guided by a public health mission, and private entities, guided by market profit-making logic, on an equal footing. WHO calls it the principle of “inclusiveness”. But it is unwise to invite the fox into the chicken coop in the name of inclusiveness. Over 50 public interest non governmental organisations, civil society organisations and social movements signed a letter to the WHO Executive Board in January calling for it to rethink and put conflicts of interest safeguards in place – click here for details. In an article published in January by Flavio Valente (published by the Transnational Institute) explores how transnational corporations (TNCs) have worked hard to shift coordination of policies in contested areas such as nutrition and agriculture from the UN system to multi-stakeholder forums. See: Nutrition and food – how government for and of the people became government for and by the TNCs. The Microsoft billionaire contributed to the WHO studies developed for the Lancet Breastfeeding series, but his initial approach to tackling infant and young child malnutrition, followed his predisposition towards technological, product based interventions – and to a large extent still does. IBFAN spent many years criticising the Gates Foundation for failing to acknowledge the central role breastfeeding plays in optimum child development. The attraction of corporate “partnerships” to policy makers in governments, UN bodies and development organisations comes from a shortage of funds. But part of the reason corporations have the money to invest in pursuing their agenda and governments do not is competition between countries to cut corporation tax rates under the threat of losing investment. This is one of the issues Patti Rundall and I addressed in our article Governments should govern and corporations should follow the rules in the journal of the UN Standing Committee on Nutrition (2012). This is the context in which Baby Milk Action and our partners work as we try to hold corporations to account and encourage policy makers to implement and enforce the Code and Resolutions. While we can measure success in terms of countries taking action and breastfeeding rates rising, much of our work involves stopping the situation getting worse. Corporations do not just give up when strong regulations are introduced, they push them to the limit and work to strike them down, while trying to sideline anyone who is critical of their activities. As discussed in part 1 of the blog post, January saw the new All Party Parliamentary Group (APPG) on Infant Feeding and Inequalities formed in the UK Parliament. This will provide a forum for policy makers to discuss the policies needed here to deliver on the Global Strategy for Infant and Young Child Feeding, which the UK has repeatedly endorsed. We asked our supporters to ask their Members of Parliament to back the formation of this group. The forthcoming assessment of UK progress in implementing the Global Strategy, using the methodology of IBFAN’s World Breastfeeding Trends Initiative (WBTi), will be a useful tool to show where the gaps are (details in part 1 of the blog post). Also in January, the European Parliament voted on new formula and baby food regulations presented by the European Commission (the civil service of the European Union). We worked with the Environmental and Consumer Protection Committee to call for the regulations to be brought into line with the Code and Resolutions. Many of our supporters contacted their Members of the European Parliament (MEPs). This would have stopped advertising of follow-on milks had it succeeded. Follow-on formula and so-called growing-up milks are unnecessary products according to WHO and the National Health Service. 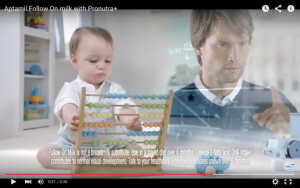 Misleading promotion such as Danone’s Aptamil advertising (below) implies its follow-on formula turns babies into mathematical geniuses and gives them the strength, stamina and balance to be ballet dancers. Although we achieved some improvements during the Commission’s consultations when it was drafting the new regulations, it would have been simpler and more effective if these had prohibited the promotion of all breastmilk substitutes, in line with the Code. Unfortunately, too many MEPs voted against improving the regulations further when they had the chance, so follow-on formula advertising will continue in the European Union, except where national governments take action. We have to work country by country for stronger regulations. Some of the MEPs who voted against prohibiting such advertising seemed to be unaware that it takes place as a matter of routine. Some felt the controls in place were sufficient. Yet in the UK we and others have won cases at the Advertising Standards Authority (ASA) proving that the public has been misled by the claims made for products. Unfortunately the ASA is a non-binding system, with no fines and no requirement for corrections, and we need stronger regulations. These products are consumed by the most vulnerable of consumers and “buyer beware” approach to promotion does a disservice to mothers and babies, whether breastfeeding or formula feeding. We did win the vote on baby foods at the Committee and then at the full Parliament on 20 January. MEPs called on the Commission to resubmit the baby food regulations to reduce the level of permitted sugar in line with WHO recommendations and to bring labelling requirements into line with World Health Assembly requirements. Exclusive breastfeeding is recommended to six months and only infant formula is needed during this period if babies are not breastfed (see UK Start for Life Guide to Introducing Solid Foods). Too early promotion of complementary foods undermines this recommendation and the products should not be labelled for use before 6 months of age. 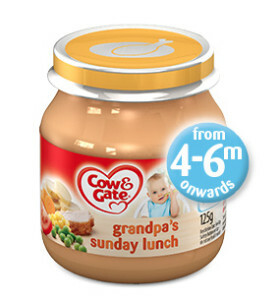 A baby eating liquidised Grandpa’s Sunday Lunch from Cow & Gate (pictured), for example, will be unable to discern the separate flavours and associate them with the colours, shapes and textures of natural foods. We still have a while to wait, but the European Commission now has to redraft its regulations. There is much more I could write about. Such as how we are working for a legally-binding treaty to hold corporations accountable for human rights abuses and our work at the Codex Alimentarius Commission, which sets food composition and labelling standards. But suffice it to say, there is much to be done and we are working with our partners on many fronts, from top-level policy to street protests where companies are targeting health workers or distributing misleading information. This work is essential. We make enough progress to know it is not a hopeless task to stand up to these powerful vested interests. We are grateful to everyone who helps us by monitoring marketing practices, supporting campaigns, sharing our information and financially. Hopefully the Lancet Breastfeeding Series will help to convince more policy makers that they should act. If you are surprised they have not done so already, I hope this blog post helps explains how powerful corporations are protecting their own interests. To keep updated on our campaigns and news, follow us on Twitter and Facebook, and sign up for our campaign alerts. You can support our work by becoming a member and donating.